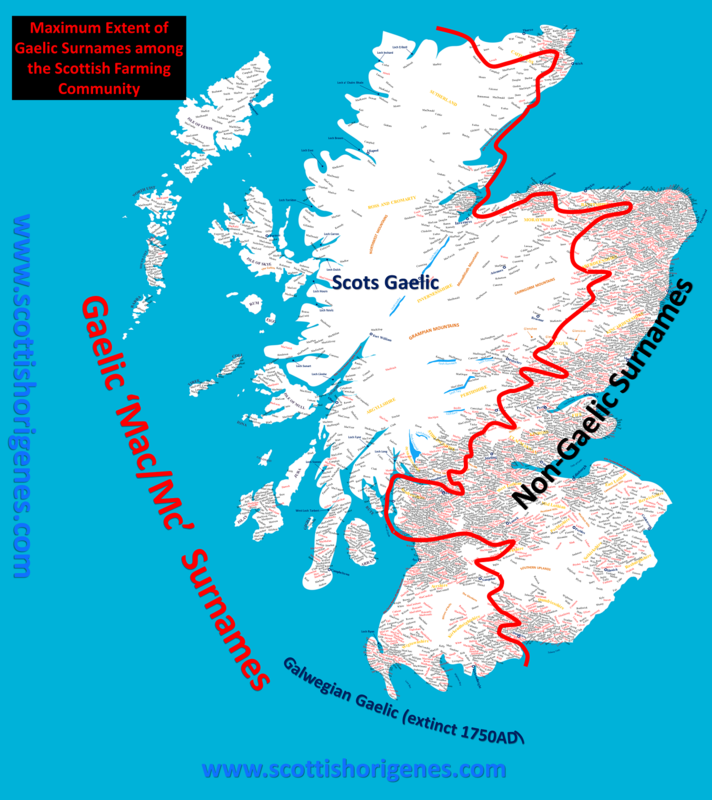 Commercial ancestral Y-DNA testing has revealed that up to 40% of all Scottish males (and males with paternal Scottish ancestry) will have a Gaelic origin (the Y-DNA test only explores the paternal line). It also reveals that the Gaelic genetic signature dominates Western Scotland with an almost perfect east/west divide as marked by the distribution limit of Gaelic Scottish surnames (see attached image). However, the origin of the Gaels has remained a mystery until the advent of modern commercial ancestral DNA testing. DNA testing has revealed that the Scottish and Irish Gaels share common origin, probably not a surprise given the shared language (Gaelic), common surnames (typically denoted by Mac’ or Mc’), common sports (Irish Hurling, Scottish Shinty) and national drink ‘Irish Whiskey’ or ‘Scotch Whisky.’ However, the concept of the Scots being descended from a ‘tribe’ from Ireland who invaded Scotland does not hold true (if that were the case then Scots Gaels would have earlier detectable links with Ireland, they simply don’t, the reverse is true with Gaelic Irish males having earlier detectable links with Scotland). In fact the term ‘Scotti’ appears to have been a term used by the later Anglo-Saxons to describe someone who spoke Gaelic. What the DNA shows is that Ireland was swamped within a very short time by a ‘Proto-Gael’ people who poured in from Western Scotland. BUT when and where did these Proto-Gaels (who would go on to form the distinctive Scottish Gael and Irish Gael identity) come from? Were the Proto-Gaels the Prehistoric inhabitants of Scotland, who one day decided to invade and turn Ireland Gael? The answer is NO! If you are a Scottish male of Gaelic origin, then your paternal ancestors are relatively recent arrivals, having first stepped foot in Scotland approximately 2,000 years ago! 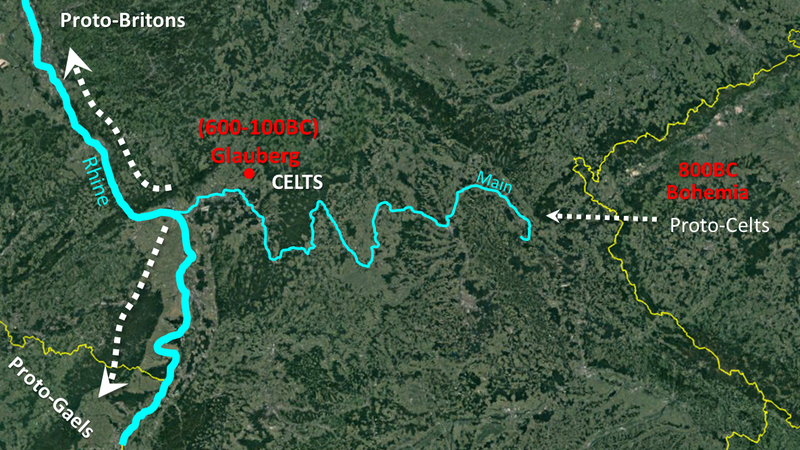 If you have Gaelic paternal origins then some of your most distant genetic relatives revealed upon Y-DNA testing will reveal their ancestors within modern Bohemia, and it is there in the western borderlands of the modern Czech Republic that the journey of the Gaels as recorded by their DNA began (see attached image). At some point the ‘Keltoi’ people of Bohemia began crossing the Erzegebirge Mountains into modern Southern Germany, where they followed the River Main towards the Rhine. 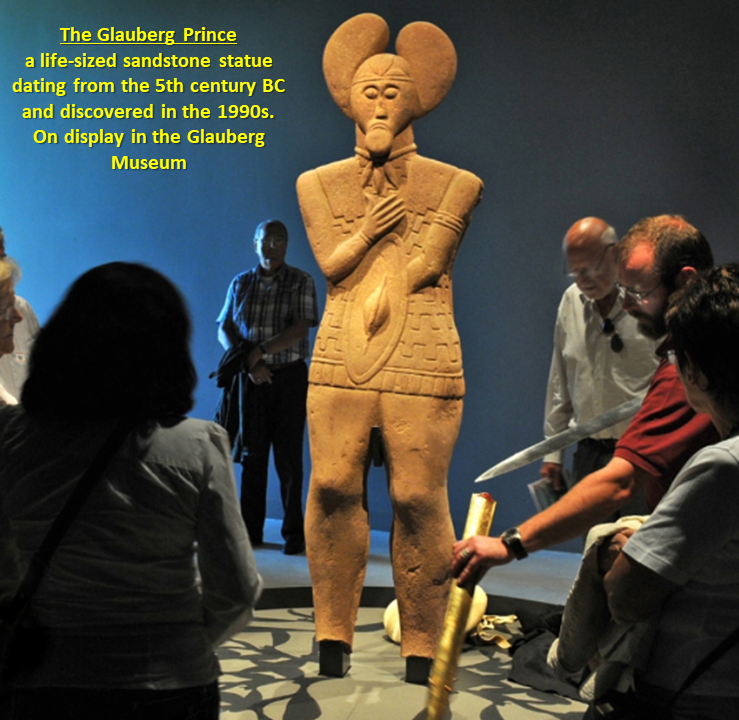 At the height of Celtic Hallstatt and La Tene Cultures the settlement of ‘Glauberg’ which lies close to the area where the River Main joins the Rhine became a Centre of Supra-regional importance. Glauberg also marks a crucial point of divergence. The hundreds of Irish, Scottish, English and Welsh DNA studies that I have performed over the years have revealed that the Celts would use the Rhine to spread throughout Central Europe. Those that spread north would give rise to the ‘Celtic’ tribes that would come to dominate the modern area of Belgium and the Netherlands, before making the short crossing into Britain and giving rise to the Britons (including the Picts of Northeast Scotland and the Ancient Britons of Strathclyde click here). But the ancestors of the Gaels (the Proto-Gaels) were part of a Celtic group that headed south colonizing the upper reaches of the Rhine, spreading towards modern Switzerland and even crossing the Alps into what is now Northern Italy. 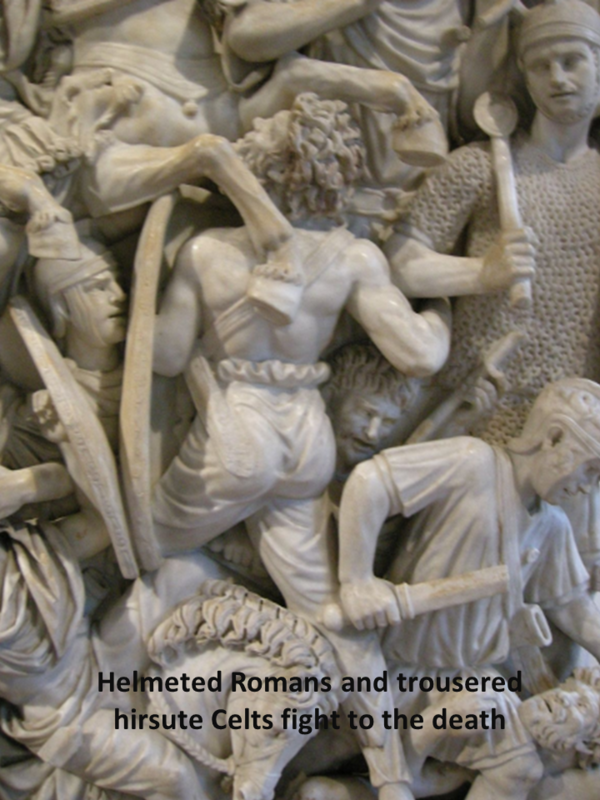 The rise of the ROMAN EMPIRE would change everything! 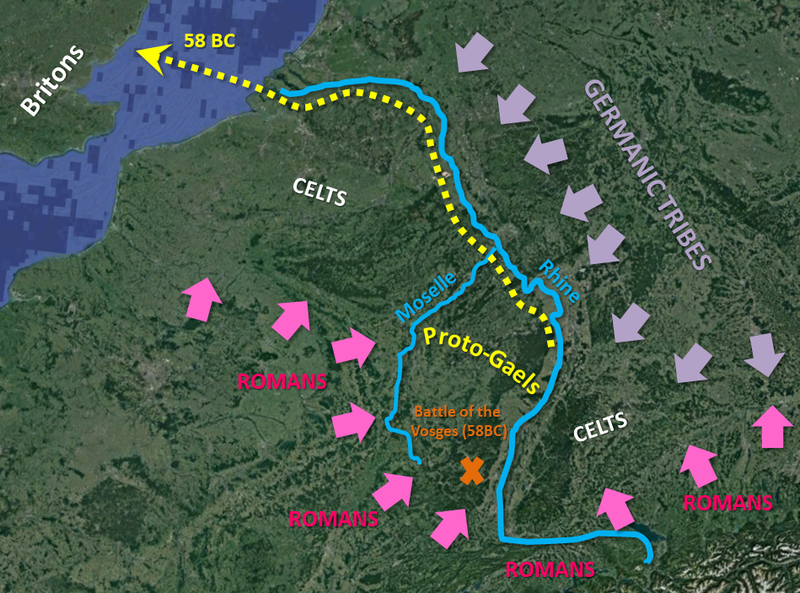 The exodus of Proto-Gaels (a mix of defeated ‘Celtic’ tribes from between the Moselle and Rhine) had begun; they sailed down the Rhine and poured into Britain. By the time they arrived in Britain these exiled Proto-Gaels were probably quite distinct from their distant Briton cousins, with the Britons speaking what would eventually become the ‘Welsh’ language, and the Proto-Gaels speaking what would eventually evolve into Irish and Scottish Gaelic. But the Romans under Julius Caesar were literally hot on their heels and he himself would invade Britain less than 3 years later in 55 and 54 BC. The shock of a Roman landing in Britain must have been immense, it propelled the Proto-Gaels north, they would not stop until they settled permanently beyond the Clyde Estuary and the Firth of Forth in Northern Scotland (although the DNA does suggest a small group that broke off and sought refuge in Devon and Cornwall in the far Southwest of England). In summary, the majority of Proto-Gaels would keep one step ahead of the Roman advance and would settle in the inhospitable lands of the Highlands and Islands of Scotland, or cross the sea into what the Romans aptly named ‘Hibernia’ (land of winter); both of which lay beyond the reach of permanent Roman settlement. The Antoine Wall (begun in 142 AD) would mark the northern most limit of the Roman Empire and stretched from the Clyde to the Firth of Forth in Scotland (see attached image). Free from Roman persecution the descendants of the Proto-Gael refugees would evolve into the Scots and Irish Gaels that would shape the modern identities of Scotland and Ireland. 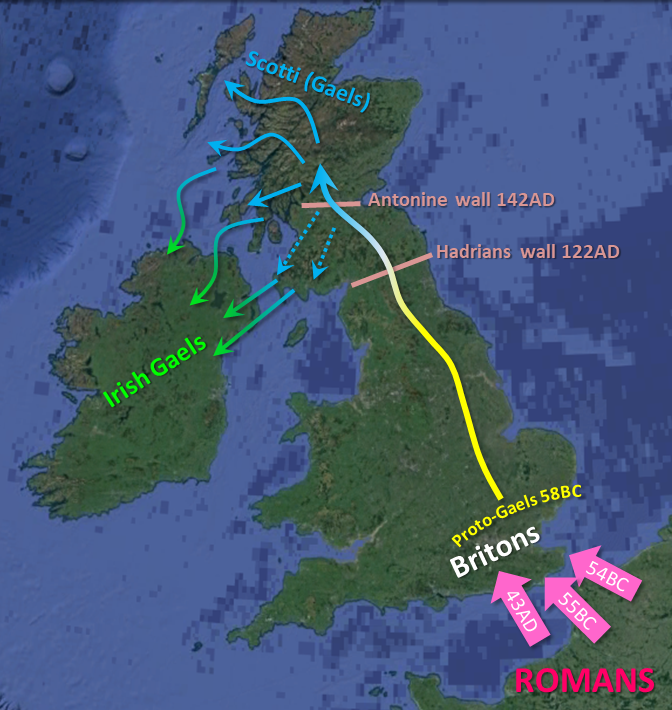 The Gaels from Scotland and Ireland would in turn plague Roman Britain for centuries with raids (one such raid would later bring to Ireland a Romano-Briton slave boy known as Patricius). The Celts that remained in Central Europe would be subsumed into the peoples and nations that evolved over the following millennia, and today males with a ‘Celtic’ Y-DNA signature have contributed in part to the modern Czechs, Southern Germans, Northern Italians and Belgians. Besides their DNA, their legacy can be found in significant archaeological evidence, some linguistic traces (e.g. Asal and Esel mean Donkey in modern Gaelic and German respectively), and of course historical accounts of victorious Roman Generals. Other subtle clues can still be found! 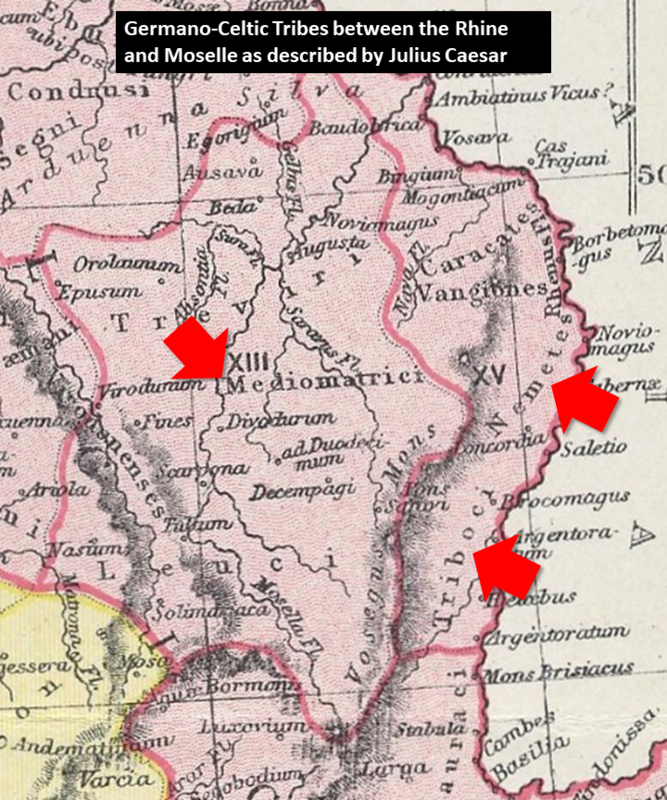 For example the Celtic ‘Boii’ gave their name to their original homeland of ‘Bohemia,’ with Boii translating as ‘the Herding or Warrior people.’ It can be argued that the Gaels were more pastoralists than cultivators, and remarkably ‘Bo’ in modern Gaelic can mean ‘cow’ and/or ‘victory’ (Gallaimh Ubu is the cry of Galway’s Gaelic football and Hurling fans). The great warrior Queen of the Britons who fought the Romans was Boudica (‘the Victorious one’) of the Iceni tribe. In addition, my own surname ‘Bowes’ is an anglicized form of Gaelic Irish ‘O’Boy’ (Grandson of the Victorious one); a reference perhaps to a notable founding paternal ancestor who was victorious in some battle fought in the Irish Midlands approximately 1,000 years ago? I have added a 2 part DNA study commissioned by Margaret Nolan (contact: margaret@margaretnolan.org) for a gentleman named Burns (the Scottish form of the Irish ‘O’Byrne’ surname) which has helped me to reconstruct the story of the Gaels. In the first Case Study I demonstrate how commercial ancestral Y-DNA testing can pinpoint an origin for one's paternal ancestor 1,000 years ago when Gaelic surnames first appeared (click here to download Part I). Part II demonstrates how one’s more distant genetic matches allow one to reconstruct one’s ancient paternal ancestral journey (click here to download Part II). What will your DNA reveal? Contact Scottish Origenes to find out about a suitable painless commercial DNA test for you (CLICK HERE), or for a FREE CONSULTATION on your DNA test results.